In this article you will learn a simple, practical approach to Vedic astrology. The Systems’ Approach to Interpreting Horoscopes, as developed by Professor V.K. Choudhry of Gurgaon, India, is based on classical Jyotish principles, tested under the empirical studies of more than 100,000 charts over a 20-year period. The Systems’ Approach is easy to learn and apply, and simplifies the process of reading charts. It is fast, precise, and gives you confidence in your analysis. More than 800 Vedic astrologers worldwide are now practicing the Systems’ Approach. This is Vedic astrology in its most contemporary form. 1. Identify the Most Effective Point of every house. The Most Effective Point is based on the rising sign degree. For example, if the natal chart rising sign is 10 degrees, 15 minutes (of any sign from Aries to Pisces), then the Most Effective Point of every house is 10 degrees, 15 minutes. 2. Note the five-degree orb. Whenever a planet is within five degrees of any other planet, or is within five degrees on either side of the Most Effective Point of any house, whether by conjunction or aspect, in either the natal chart or by transit, then the planet’s benefic or malefic influence is considered close and applicable. Benefic and malefic planets, however, can co-exist without problems (whether by conjunction or aspect), when they are safely outside the five-degree orb from each other. 3. Determine the functional nature of planets. Planets operate as either functional malefics or functional benefics in any given chart. The functional malefic planets are Rahu and Ketu for all rising signs, along with planets ruling mooltrikona signs falling in the dusthana (inauspicious) houses – which are the sixth, eighth, and twelfth houses, as counted from the ascendant. Under Systems’ Approach, the mooltrikona signs are 1, 4, 5, 6, 7, 9, and 11 — Aries, Cancer, Leo, Virgo, Libra, Sagittarius, and Aquarius. These signs are ruled by Mars, Moon, Sun, Mercury, Venus, Jupiter and Saturn, respectively. This is an important key to accurate readings. In the future, simply note whether any mooltrikona sign (1, 4, 5, 6, 7, 9, or 11) falls in the malefic sixth, eighth, or twelfth house; and, if so, the rulers of these houses become functional malefics for that rising sign specifically. This explains why some people have good results with traditional malefic planets, and poor results with traditional benefic planets. In other words, Sun, Mars, and Saturn are not malefics for every chart; and, Mercury, Jupiter, Venus, and Moon are not benefics for every chart. The application of this principle shows that the number of functional malefic planets varies for each rising sign, as indicated in the following list. Note: If a planet is not a functional malefic, then it is a functional benefic. There are no neutral planets in this system. The Most Malefic Planet in any chart is the lord of the eighth house, if containing a mooltrikona sign. If there is no mooltrikona sign in the eighth house, then the Most Malefic Planet becomes the lord of the twelfth house, if containing a mooltrikona sign. If neither the eighth house nor twelfth house contains a mooltrikona sign, then Ketu becomes the Most Malefic Planet in the chart. Natal chart and transit interpretations are always done with reference to the ascendant. Interpretations are not done using any other sign, house, or lord independent of the rising sign. Measuring the strength of the planets: There are 30 degrees in a sign. Planets in the first five degrees of a sign are considered in infant state and are rendered weak. Similarly, planets in the last five degrees are considered in old age, and are also weak. Just as an infant or elderly person cannot protect or provide for others, these planets need to be strengthened when they are functional benefics in a chart. The results of planets vary in degree of strength as per their longitudes. That is, when planets are in their infant state their power is 0%, 20%, 40%, 60%, 80%, and 100% when they are 0, 1, 2, 3, 4, and 5 degrees, respectively. When planets are in their old age state their power is 100%, 80%, 60%, 40%, 20% and 0% when their longitude is 25, 26, 27, 28, 29, and 30 degrees, respectively. Weak Planets: Planets are considered weak if they are: 1. In their signs of debilitation. 2. Are combust. 3. Are in the state of infancy (first five degrees of a sign). 4. Are in the state of old age (last five degrees of a sign). 5. Placed in a malefic house (the sixth, eighth, and twelfth) in the natal chart or by transit. A weak planet does not have the ability to fully protect either its general or particular significations. The general significations refer to the subjects ruled by the planet. The Sun, for example, rules father, status of the native, heart, digestive system, etc., irrespective of the house lordship of the Sun in a natal chart. The particular significations refer to: 1. The significations of the house where the planet’s mooltrikona sign is placed, and, 2. The house where the planet is placed in the natal chart. Afflictions: The afflictions to the planets and houses are caused by the close conjunction or aspect (within five degrees) of the functional malefic planets in a natal chart. Whenever a weak planet is afflicted by a functional malefic planet, the results of its significations manifest with delay, or suffer altogether. Afflictions in the natal chart cause damage during the entire sub period of the weak planet or of the afflicting planets. Afflictions to the weak planet during the transit influences cause only short-term damage, and last only for the duration of the operating transit influence. Exalted Planets: Whenever planets are placed in their signs of exaltation they are considered to have additional strength. Whether or not they are placed on the exact point of exaltation has very little relevance. The exaltation power, however, is reduced if the planet is closely afflicted by functional malefics in the chart, or if it is badly placed (in the sixth, eighth, or twelfth house). Combust Planets: When the Sun is a functional benefic planet, its conjunction with other well-placed functional benefic planets is considered good. It gives exponential growth relative to the significations of the planet in close conjunction with the Sun. However, the combust planets will suffer when they are under the transit malefic influences. On the other hand, when the Sun is a functional malefic and is closely conjunct with other planets, then all the planets involved suffer. This is because the planets become afflicted by the conjunction of the functional malefic Sun permanently — due to their natal chart positions. The combust planets in such cases also suffer in transit afflictions. Measuring strength of the houses: The strength of the houses and the signs is gauged through the strength of their lords and the conjunctions and aspects to the Most Effective Point of the houses. Analyzing non-mooltrikona signs: Until and unless there is a close malefic influence on the Most Effective Point of a house containing a non-mooltrikona sign, the significations of that house will not bother a person. That is, generally people will not seek astrological consultations or remedies relevant to the significations of those houses containing non-mooltrikona signs. Use of divisional charts: The divisional charts are used for judging the strength of a planet while studying its impact in a particular field. Any planet occupying its sign of debilitation in a particular divisional chart will fail to protect its significations in its sub periods. We consider the lord of the ascendant of the divisional chart. If, for example, the ascending sign of the dasamsa (profession chart) is a mooltrikona sign of a particular planet, the same planet is also considered as a prime determinant of the profession. However, if there is no mooltrikona sign in the ascendant of the dasamsa, we then consider the position of the primary and secondary determinants of the professional affairs of the natal chart in the dasamsa. For judging the strength of the primary and secondary significators, we have to see if these planets have gone to their signs of debilitation in dasamsa. Capability of planets to bless with their significations: It is necessary to study both the natal chart and the transit position of the planet. The planet will be able to bless the native with both its general and particular significations if it is strong both in the natal chart and in transit. The planets, according to their strength in a horoscope, give the results of the significations and houses ruled by them in their main and sub periods. Though various types of planetary periods for specific combinations in a nativity are mentioned in classical texts, the Vimshotri Dasha system has been mentioned for general applications and is used exclusively under the Systems’ Approach. During the sub period of a planet, the following three significations are operating: 1. The general significations of the planet. For example, the Sun rules father, social status, government, male child, digestive system, heart, blood pressure, etc. 2. The particular significations of the house where the mooltrikona sign of the operating planet is placed. For example, if a functional malefic planet is conjunct or aspecting the Most Effective Point of a house, the significations of the mooltrikona sign and house will not prosper and will be subject to the problems indicated by the lordship of the afflicting planet. 3. The significations of the house where the planet is placed. The results of the general significations of the sub period lord depend upon its functional nature, strength, placement, and any close aspects or conjunctions to the sub period lord. The significations of the house of placement are influenced when transit planets create benefic or malefic influences on the sub period lord. Transits refer to the planetary positions at any given time after the date of birth. Transiting planets are studied with reference to the natal chart ascendant, in relation to the original position of the planets in the natal chart, and not with reference to the natal Moon sign. Significant events are triggered by the transit of planets over the natal planetary positions. Whenever a functional malefic planet transits a weak natal position, it triggers an undesirable incident concerning the planet and the house involved. This is more so when the weak natal planet is also weak in transit. Any house whose lord is weak is treated as a weak position. The afflicted planets and houses are those planets and houses with which the functional malefic planets form exact or close conjunctions and aspects. The result of a particular house will be influenced by a transiting planet when it is near to its Most Effective Point, depending upon its functional nature whether benefic or malefic. The impact of transit functional malefics is on both functional malefics and benefics. The subjects governed by the planets are their general and particular significations. The significations of a functional benefic planet are harmed when it transits the natal position or close aspect of a functional malefic planet. Whenever planets in transit form conjunctions amongst themselves, the events occur depending upon their functional nature in connection with the house with reference to a particular ascendant. Whenever the functional benefic planets transit auspicious natal positions, they trigger happy incidents. During the main periods of the functional benefic planets, benefic transit effects are more pronounced, while malefic transit effects are mild. Similarly, during the main periods of functional malefics, the benefic transit effects are mild while the malefic transit effects are more severe. Reading transit results: The sub period lord sets the trends. However, transit effects can supersede the trend results of the sub period lord and create significant events. The malefic effects of slow moving functional malefic planets, i.e. Jupiter, Saturn, Rahu and Ketu, are more pronounced when during the course of their close conjunctions or aspects, they become stationary, or move more slowly as compared to their normal speed. In essence, the sub period planet sets the trend as per its mooltrikona sign lordship, house placement, and other influences on it in the natal chart. The transit planets then cause influence whenever they come into contact with the sub period planet’s natal or transit position. Whenever the transit planets – both the functional benefic planets and the functional malefic planets – transit over the natal functional malefic planets, then the significations ruled by the transiting planets suffer badly. Whenever a transiting functional malefic planet transits the Most Effective Point, it affects the house in which it is located and all the houses which it aspects. Take, for example, a natal chart with a Sagittarius ascendant. In this chart, the sign of Libra is placed in the eleventh house. Now, suppose the eleventh house lord, Venus, is placed in the twelfth house of loss. Then, during the sub period of Venus, there could be loss relating to eleventh house significations — such as elder brother or income – or, there could be trouble to friends. Even the death of the elder brother could occur if, by transit, the functional malefics Rahu and Ketu form a close conjunction or aspect to any of the following: 1. The Most Effective Point of the eleventh house. 2. The natal position of Venus. 3. The transit position of the sub period lord, Venus. The key issues in analyzing a horoscope are: 1. Identifying the functional nature of planets in a nativity. 2. The techniques for judging the strength of a planet. 3. The distinction between the weak and/or afflicted planets. 4. The impact of weak and/or afflicted planets. 5. The orb of longitudinal difference for judging the impact of conjunctions and aspects. 6. Identifying the impact of the Most Malefic Planet. 7. The Most Effective Point of various houses in a chart. How to analyze a chart: Note the ascendant degree, which becomes the Most Effective Point of every house. Underline the functional malefic planets. Identify the conjunctions and aspects within a five-degree orb from each other. Put a circle around the planets and houses that are afflicted due to the close influence of the functional malefic planets. Note the weak, badly placed, and afflicted planets, and/or the sub period of the functional malefic planets (for trend results). A functional benefic planet becomes weak if placed in any of the malefic (sixth, eighth, or twelfth) houses. The Systems’ Approach also considers the strength or weakness of a planet that is placed in the mooltrikona sign of another planet. Problems are always with regard to the weak, badly placed and afflicted planets or the sub periods of the functional malefics. Short-term problems are indicated by the malefic transit over the weak natal planets. Good results are identified for the significations of the well-placed strong planets having good and close conjunctions or aspects. The best thing an astrologer can do is to indicate, in the shortest possible time, the strong and weak areas in a chart and prescribe the appropriate remedies. The problems in life are caused by weak or badly placed functional benefic planets or afflictions to them. To help people overcome their problems, the astrologer advises appropriate astral remedies, such as meditation and spiritual practices, color and gemstone therapy, the wearing of a kavach or amulet as a protective shield, and the participation in pujas and yagyas, etc. The strengthening astrological remedial measures are suggested for all the functional benefic planets even if they are not weak and afflicted in the natal chart. The strengthening measures provide a preventive cover to the planets against their transit weakness. Similarly, the propitiating remedial measures are advised for all the functional malefic planets even if they are not forming close afflictions in the natal chart. The propitiating remedial measures provide a preventive cover for transit and natal afflictions. When planets indicate tragic happenings, people usually do not perform astral remedies to protect themselves against the expected losses. (The weakness of Jupiter and the lord of the ninth house is always a contributing factor in this regard). The indications of time can only be modified with the help of the astral remedies. Until and unless the astral remedies are performed, the extent of the services of the divine science of astrology is very much limited. The planetary relationships give results as per the indications in case no preventive remedies are performed. This is the chart of the son of President John F. Kennedy, the late John F. Kennedy, Jr., who tragically died in an airplane crash at sea on July 16, 1999. His wife, Carolyn, and her sister, Lauren, were also killed in the accident. The rising sign is Leo. The Most Effective Point of every house is 18:39 degrees. The functional malefics for this chart are Rahu, Ketu, and Moon. The functional benefics are Sun, Mars, Mercury, Jupiter, Venus, and Saturn. Rahu, the significator of unexpected events and calamities, afflicts Saturn, the significator of longevity, and Venus, the significator of wife and conveyances. Rahu also closely afflicts the first house (personal calamities), the fifth house, (he had no children), the seventh house (his wife died with him), and the ninth house (his father was assassinated). Ketu, the significator of miseries and obstructions, closely afflicts Mercury, the ruler of the second house of status and continuation of family life. Sun, the ruler of the rising sign, is well placed in the fourth house and shows good results relative to mother, fixed assets, and domestic happiness. The well placed and unafflicted Sun, along with Rahu in the first house, gave him fame, fortune, position, charisma, and popularity. The Sun and well-placed lord of the ninth house, Mars, also gave him gains, good fortune, and executive skills. The lord of the second house, placed in the third house, gave him status in life through his own self-efforts. The well-placed Jupiter gave him higher education and a degree in law. Note that none of the planets are placed in the malefic sixth, eighth, or twelfth houses. This helped provide John F. Kennedy, Jr. with good health, fame, wealth, status, mental development, self-efforts and initiatives, education, partners, and good fortune. Unfortunately, even all of these well-placed planets were not able to safeguard against the close affliction of the Rahu-Ketu axis to the Most Effective Points of the various houses they occupied and aspected in the chart. The astral remedies could have helped to reduce the impact of the malefic influences and severe afflictions indicated in this chart. At the time of his death, John F. Kennedy, Jr. was running the Saturn main period and Mercury sub period. The main period lord, Saturn, is the natural significator for longevity and is afflicted in the natal chart by Rahu, the significator of unexpected events and calamities. The sub period lord (and operating planet), Mercury, is closely afflicted in the natal chart by the aspect of Ketu, the significator of violent accidents, miseries and wounds. Note that Mercury is placed in the air sign, Libra, ruled by Venus. Venus is the significator of conveyances, and is under the exact affliction of Rahu by aspect from the first house. 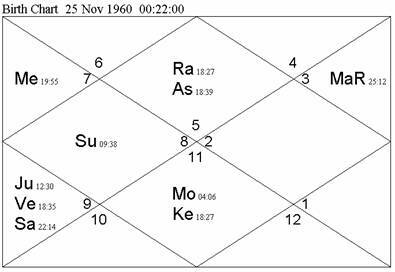 On the day of John F. Kennedy Jr.’s death, Mercury was transiting the twelfth house of loss, closely conjunct transiting Rahu. Sun, the lord of the chart, was extremely weak in transit at 00:15 degrees in the malefic twelfth house. Moon, the Most Malefic Planet in this chart, was transiting the first house, over his natal Rahu. In addition, transiting Rahu and Ketu in the twelfth and sixth houses, respectively, were at 19:10 degrees, (within one degree of the Most Effective Point), thus afflicting all of the houses they occupied and aspected — including the malefic sixth, eighth, and twelfth houses. David M. Hawthorne, M.S., J.B., received his Master’s degree, and the titles of Jyotish Bhanu and Professor of Astrology, from the Systems’ Institute of Hindu Astrology, Gurgaon, India. He is the co-author, along with Professor V.K. Choudhry, of Astrology for Life: How to Be Your Own Vedic Astrologer. Mr. Hawthorne is a member of both the American Council of Vedic Astrology (ACVA), and the Systems’ Institute of Hindu Astrology (SIHA). 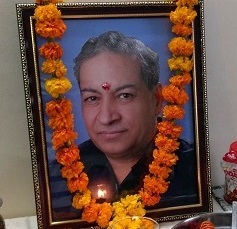 He is also the President of the International Institute of Predictive Astrology (IIPA), with more than 600 Vedic astrology members from 40 countries worldwide.